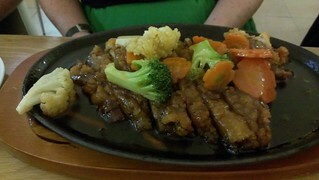 That night, the night before World Vegan Day, we met up with some bloggers for dinner at Loving Hut Northcote. 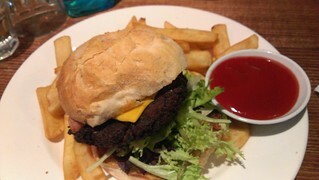 We had bloggers from Veganopoulous, Where's The Beef, Green Gourmet Giraffe, Veganise This and The Good Hearted. 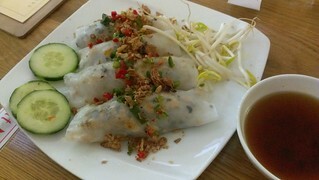 Leigh and I shared some Steamed Rice Rolls with Mushroom Mince. 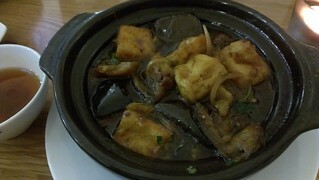 I had the Eggplant and Tofu Hotpot, which was lovely. 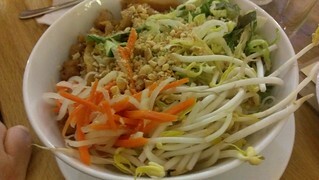 Leigh had the refreshing Lemongrass Chicken with Rice Noodles. I didn't get a photo of everyone's food, because it was a long table, here here are some of the other dishes. 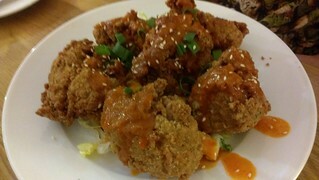 The Volcano (southern fried chicken with volcano hot sauce). Loving Hut also has a dessert case, including treats from La Panella as well as some fancy cakes. 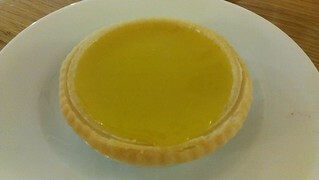 I went for a Lemon Tart. Where's The Beef has also blogged about this dinner (with much better photos of their dishes) here. 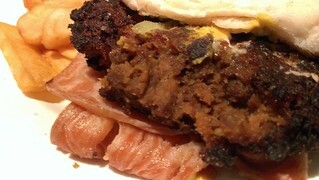 You can see what Veganopolous ordered here. 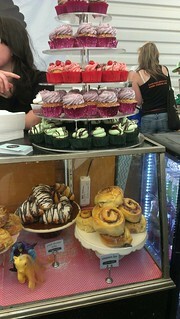 The next day was our final day in Melbourne, and we attended the yearly festival World Vegan Day. I didn't actually take that many photos of the day. For the best round up of everything that was there check out this post by Veganopolous. Before heading off to WVD we had a breakfast of leftover pastries in the hotel - an Orange Poppyseed Muffin and half a sourdough cinnamon sugar doughnut from Crumbs. No green juice due to tragic mold issues. We had hoped to get a green juice or smoothie at WVD, though there didn't seem to be anything like that in sight. So we went for the next best thing - and Apollo. I am not actually sure of the name of the stall that had this. 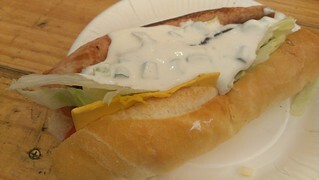 It was a pastrami dog, facon, cheese, lettuce, tomato and tzatziki. So yummy! We ran into Krisy again while sitting down and eating, and she shared some of her dosa with me. 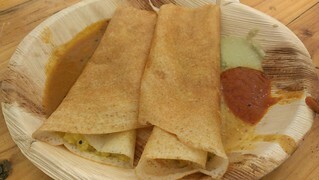 I have never had dosa before! 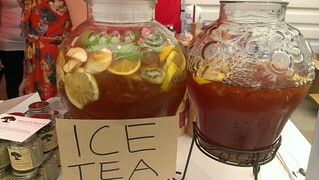 There was some beautiful iced tea available by Impaka & Peacock. 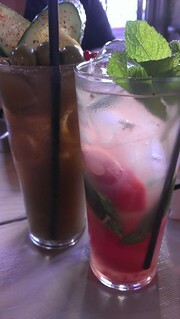 One was a fruity rooibos and the other a fruity mint and lemongrass. I tried and enjoyed both, though the rooibos was my favourite. 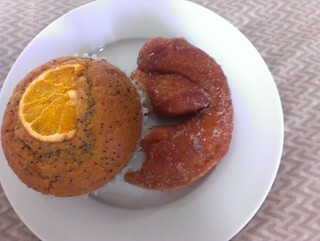 I heard that Vege 2 Go had cinnamon sugar doughnuts, and they did! 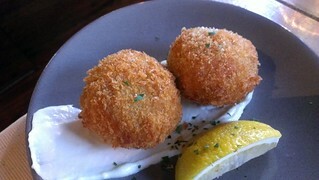 These were not as good as the Crumbs or Smith & Daughters doughnuts, but were still very nice. I ogled the treats (and first generation My Little Pony) in the Mr Nice Guy Bakeshop case. 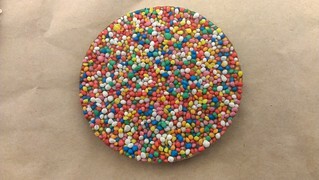 And I tried a chocolate rainbow freckle from Compassionate Kitchen after reading so much about them on Veganopoulous. In non-food adventures, we stopped by the Bed & Broccoli stall to pick up a signed copy of Nikki's beautiful cookbook (launched that day! ), looked at the art exhibit (I bought the sweetest artwork of a kitty) and spent some time looking at all the stalls. As usual I have non-buyers remorse. I always talk myself out of buying things, and then immediately regret not buying them the moment that I am in a position to no longer be able to get them. Oh well! 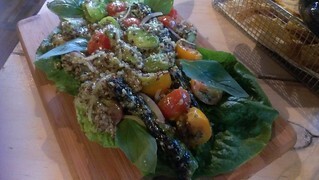 Leigh also did a cooking demonstration out of her new cookbook Greenilicious. I was a tester for this book and it is great and you should all buy it! It was getting really busy, and we reached our limit of squeezing past lots of people in the two halls, so we decided to call it a day. Thanks World Vegan Day, you were fun! We caught a tram back into the city and had a little bit of time to kill before we needed to get to the airport. We had hoped to get to Yong Green Food one more time, but alas we just missed a tram that would have taken us there and we would have a been a bit pressed for time taking the next one. 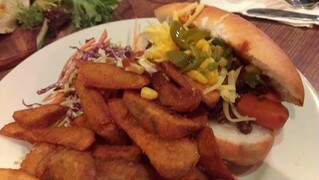 Instead we decided to try out Supercharger, a little vegan place in the Emporium. This doesn't have a website, but I had read about it on Where's The Beef and Veganopoulous. So thanks guys! Basically you choose a base and then up to five toppings/sides. It is $12 for three sides and $14 for five, so of course we got five! They also sell smoothies and 'blends'. Blends are cups full of vegetables and fruits and juice that they blend up for you once you make your choice. 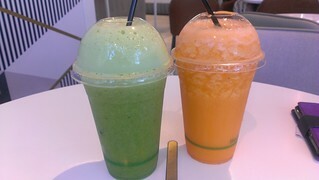 I chose the Broccoli and Kale one and Leigh got the Orange and Carrot. I don't remember the exact names of what I chose, but I shall describe it. 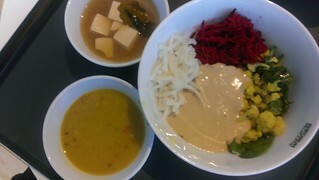 I had potato mustard mash for the base, with daikon and garlic pickle, cauliflower and lentil smash, raw beetroot and carrot salad and tahini sauce in the big bowl, and there is daal and tofu miso soup in the little bowls. 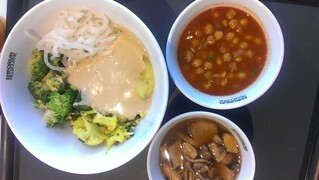 Leigh also got the potato, the daikon, the cauliflower and tahini sauce, but got some raw broccoli salad, a chickpea curry and some mushrooms in ginger broth. 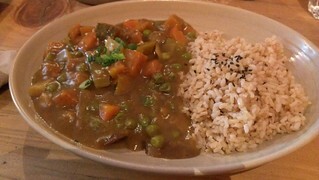 This was all delicious, a perfect antidote to a week of fairly rich eating! I would definitely recommend eating here. Where's The Beef has excellent directions for how to find it in the shopping complex. Then it was back to Southern Cross station to catch a bus to the airport. 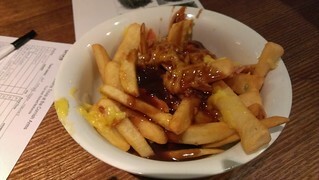 Southern Cross has a Lord of the Fries. I have eaten there once in Sydney and wasn't a huge fan. 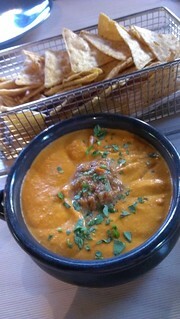 Leigh ordered some sweet potato fries with the peanut sauce (the sauce of the month). I'm afraid it tasted about as good as it looked, which is not very. The sauce was just like melted peanut butter with a whole lot of salt mixed in. Blergh. Lord of the Fries is yet to win me over. Then it was to the airport and a farewell to Leigh, she was flying back to Sydney and I was on my way to Brisbane. My flight was delayed, but once it got underway I got fed dinner! I flew with Qantas because I am using up frequent flier points, and for main meals they will do a vegan option. It was actually pretty good for plane food, rice with black eyed peas and a cauliflower curry. So ends my Veganventure. I had such a great time, ate amazing food and met some really awesome people. But of course I was glad to be home and was all to eager to be hugging my beloved kitties again! 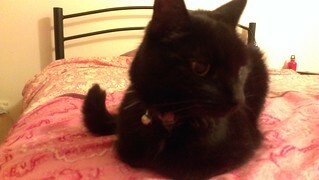 Once I was home and settled I was very happy to get into my own bed with my own cats. 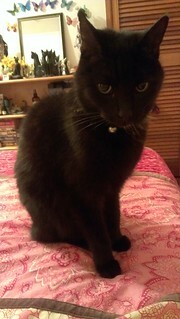 Dim Sim settled down on the bed with me, so she has a beautiful welcome home photo. 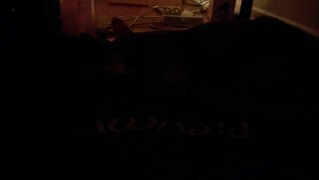 Sahara was on her blankie under the bed, so she has a very dim, dark, vague welcome home photo. We had booked a birthday dinner at Smith & Daughters that I had been looking forward to for weeks and weeks! 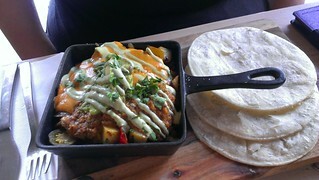 Unfortunately our Trippy Taco tummies were still feeling very unhappy, but of course we went hoping for the best. We started off with some drinks. Leigh had the Virgin Frieda (a virgin bloody mary) and I had a Watermelon Splash of Lash (coconut water, lime, mint and watermelon). 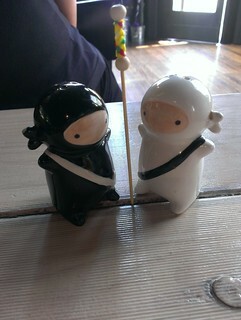 They have a fabulous collection of salt and pepper shakers, and we were sharing our table with these awesome ninja friends. Smith & Daughters has a seasonal menu that takes the form of share plates, tapas and salads. We ordered the Layered Queso Dip (black bean dip, cashew cream, salsa and corn chips), Pastels de Cangrejo (herb and lemon crab cakes with mango salsa and avocado cream), Paella Fritters (with garlic aoli) and Seasonal Arco Iris Salad (heirloom tomatos, asparagus, baby cos, avocado, quinoa in basil dressing). 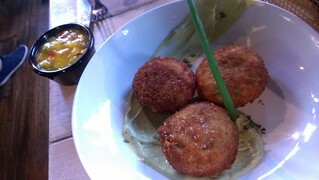 The queso is glorious and rich, the salad was refreshing and light, and the paella fritters were crunchy and tasty. The crab cakes were great, though once I saw the strands of actual faux crab in them then that was all I could taste and I am not a fan of that flavour. Unfortunately our tummies were extremely sad, so we could not finish our delicious dinner. 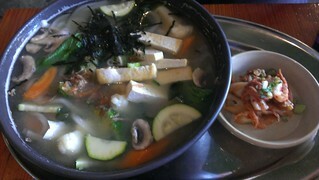 I felt so bad, because the food was great, but our stomachs just couldn't handle it. We slowly walked back to the hotel for much peppermint tea, tummy rubbing and Trippy Taco cursing. 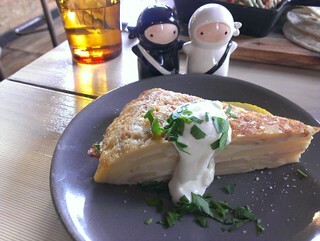 But all was not lost, because we had booked in for brunch at Smith & Daughters the following day! Thankfully after a night of sleep and a green juice to test the waters, our tummies were back in action! We arrived at 10am for brunch (opening time), and we were the first people there. It was a much quieter, more relaxed atmosphere compared to dinner the night before. I was able to have a wander around and look at their salt and pepper shaker collection. Sadly they have to keep a lot of their favourites up behind the bar because people steal them! Jerks. 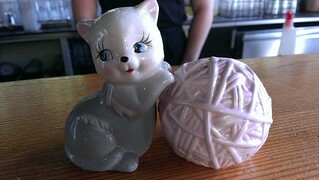 They were nice enough to take this adorable kitten and wool ball one down for me to take a photo of. 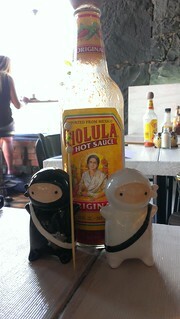 Speaking of salt and pepper shakers, check out who our brunch companions were! NIIIIIIINNNNNNJJJJJJAAAAAAA! Leigh ordered another Virgin Frieda (sadly I tried a bit and because it has freshly juiced jalapeno and also hot sauce already added to the tomato and cucumber juice, it was way too spicy for me) and a Mexican Hot Chocolate, and I ordered a soy chai latte. Oh. My. God. Their chai is the best I have ever had. Better than the Spicy Chai at Sweetpea in PDX. It is amazing! They brought the actual bag of chai down for me to smell - heaven! 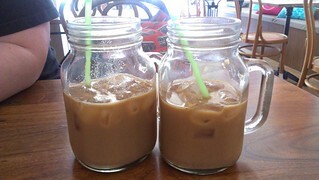 I ended up having three chai lattes while we were their - soy, almond and oat. One of the things I was sad I didn't get the night before was the Tortilla, a big wedge of cold potato and onion spanish omlette with garlic aioli. It was simple, but delicious. Leigh got the Mexican Potato Hash, which had potatoes, peppers, corn, jalapenos and guacamole, topped with queso, salsa and cashew cheese and served with corn tortillas. She reports that this would be too spicy for me! 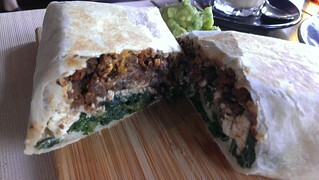 I got the Breakfast Tortilla, which had scrambled tofu chorizo, black beans, garlic kale, guacamole and chipotle cashew cheese. This was so amazing! They also have chia pudding, omelette and french toast on the brunch menu, as well as a selection of dishes from their dinner menu. They also have their desserts available! This was good, as we were unable to manage dessert the night before. 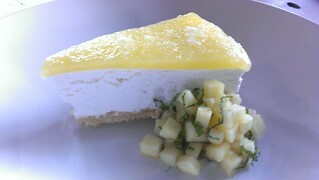 Leigh had the Pina Colada Cream Pie. 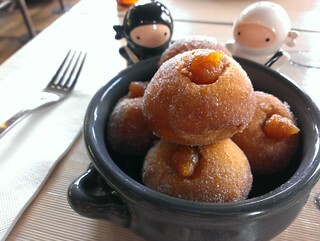 I had the Warm Spanish Doughnuts, stuffed with quince and dusted in spiced sugar. These were amazing! Hot and fresh and perfect. Not as good as sourdough cinnamon sugar doughnuts, but they come second only by a whisper. 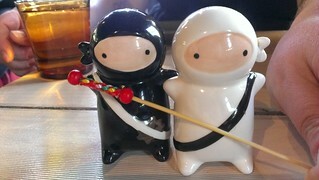 Even the ninjas wanted to get in on the doughnut action! All up this was an exceptional dining experience! I think Smith & Daughters brunch is an essential part of any Melbourne trip. I was sad to say goodbye to our ninjas. Holding some very happy tummies, and a fourth chai (this one made on hazelnut milk, I got it to take away), we headed up Brunswick Street to visit the Melbourne branch of The Cruelty-Free Shop, where Leigh was signing some of her cookbooks and we had a good browse at their great range. Afterwards we found ourselves a bit peckish, and conveniently just down the road from Yong Green Food (on Brunswick Street you are always just up the road or down the road from somewhere delicious!). To Yongs we went! It was another hot day, and I was in the mood for refreshing and light. 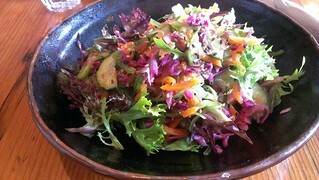 I ordered the Seaweed Salad, which was just perfect. I think this might be my favourite thing I had at Yongs during the trip. 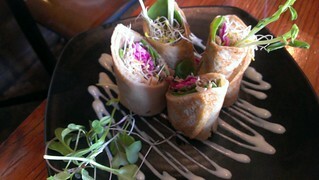 I also got the Buckwheat Crepe (organic buckwheat crepe with braised shitake mushrooms and wasabi soy mayo), which was lovely. 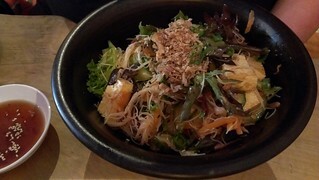 Leigh also started light with the Vietnamese Coleslaw (cabbage, cucumber, carrot and green beans mixed with lime and chili dressing, topped with cashews), but then went rather weather inappropriate with a steaming hot bowl of Miso Udon (udon cooked in miso soup topped with organic tofu served with kimchi). Worth it. After our late lunch, we went back to the hotel for another rest from the heat before dinner. On the way we stopped off at Smith & Daughters so I could pick up my fifth chai of the day (large, soy milk). 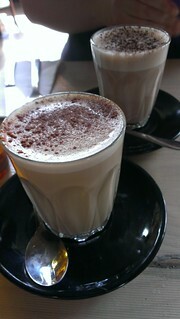 Seriously, best chai ever. 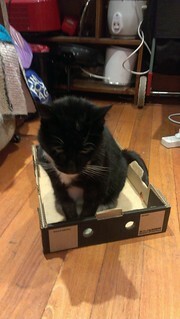 Before we left Sydney Leigh's cat Squeak took a sudden and unexpected interest in this box. She was very pleased with herself! We were catching a tram to meet up with Kristy (from the blog In The Mood For Noodles) and her baby for lunch.I first met Kristy (and her husband Toby) when we were in Portland at the same time in 2011, then again when they came to Brisbane in 2012, so I was looking forward to this lunch a lot. It was lovely to see her again! 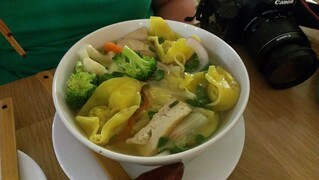 We went to Yong Green Food again for lunch. This time I had the summer rolls (veggies, tofu and pear wrapped in daikon slices, served with sweet mustard dressing) and the Japanese Curry (potato, carrot, mushroom, green beans and sliced soy beef cooked in mild curry paste, served with biodynamic brown rice). 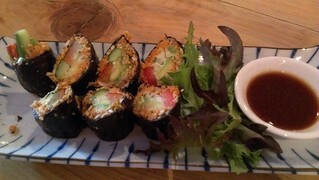 Both were good, but I particularly loved the summer rolls, they were so light and fresh. I pulled the capsicum out of them before eating, of course. 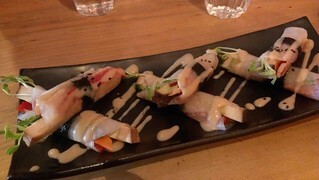 Kristy had the Mock Salmon Roe (carrots wrapped in raw nori with sunflower seeds, sesame seeds, capsicum, cucumber, avocado and cashew cream, served with wasabi tamari sauce) and the Tofu Katsu (picture on yesterday's post). Leigh had the Kimchi Dumplings and Dailon Salad (both pictured in yesterday's post) and the Cold Rice Noodle Salad (rice noodles mixed with carrot, cabbage, cucumber, tofu and red chili paste). When she ordered she was warned that this was very spicy, so I was not game to even sample a little bit! But she enjoyed it. 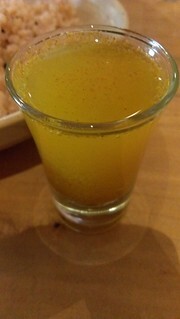 I also had a Detox Shot (turmeric, spirulina, acai), because it sounded intriguing and possibly really gross. But it was actually lovely! Plus turmeric is meant to be anti-inflammatory and I am a pro-inflammatory type, so I am meant to have more turmeric apparently. After saying goodbye to Kristy and son, we were going to stop by Big Lou's for some vegan jam doughnuts, but they were inexplicably closed (the woe!). So we ended up stopping in at Radhey Chai Bar for some chai. We both got an almond milk iced chai, which was just okay and had a very grainy texture and the ice made it go grainy very quickly. They also have vegan food and desserts, but all the desserts were raw. For dinner we went to Cornish Arms to meet up with some people for vegan pub food and trivia. Cornish Arms isn't a vegan bar, but does have a vegan menu and vegan alcohol is also clearly marked. 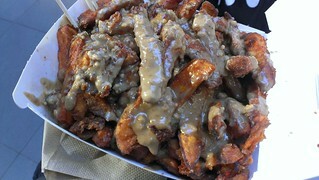 We jumped in with the vegan version of Full Wu Tang Fries - chips, gravy, bacon and cheese. So delicious. 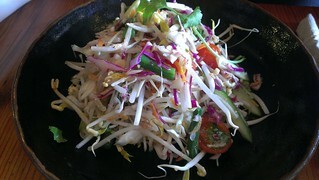 The menu is heavy on the pub food - carbs and fried (though there is a Thai salad bowl if you are that way inclined. 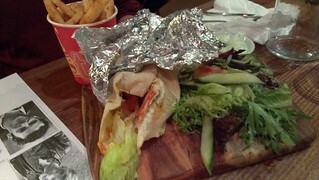 Michelle ordered the chicken burger, Jess had the Chili Dog and Leigh ordered the Souvlaki Wrap. I ordered the vegan cheeseburger. This had a TVP patty, pickles, lettuce, cheese (I think a Tofutti slice), cured onions, ketcum, mustard and mayo), and I added bacon. 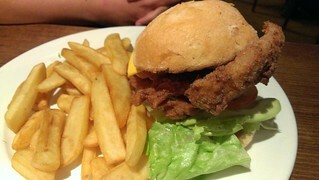 I really enjoyed the patty! The bacon they use is super streaky and fatty, I am not sure what brand it is. The next morning was my birthday, yay me! I turned 33. We headed straight back to Crumbs for breakfast. We started with a savoury option - the Tocotta, spinach, sundried tomato, olive tapenade and red onion Calzone, which was pretty damn awesome. 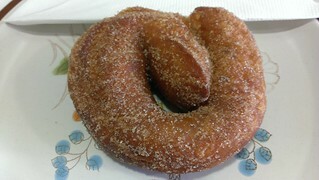 And then of course I had a sourdough cinnamon doughnut. Because they are life! Leigh had another lemon curd one, and then we also shared another cinnamon sugar crescent doughnut. I got a couple of doughnuts to take away for snacking. 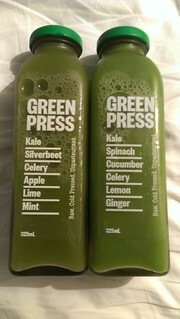 We walked into the city and visited Green Press to pick up some green juices to take back to the hotel for later. I had the kale and silverbeet one the following morning, which was nice, but sadly when I went to drink the kale and silverbeet one I found a big chunk of mold in the bottom and had to tip it all away. It is sad to tip $9 worth of yummy smelling green juice down the drain. Our trip to the city included successfully locating a Groot bobblehead for Leigh and also doing some shopping in Chinatown for Leigh's World Vegan Day demonstration on Sunday. 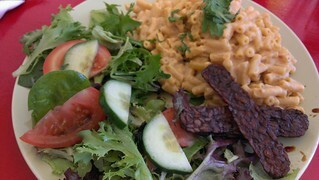 For lunch we went to Las Vegan, where I got to have birthday Mac and Cheese! 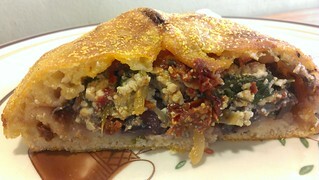 With a side of tempeh bacon! Best!! It was soooooo good. 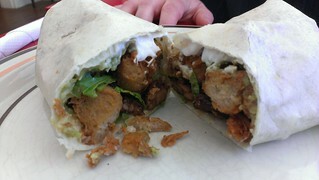 Leigh had the Tempacon Nugget Wrap, and she also got the T+T Salad, which was meant to have the world's best satay sauce. 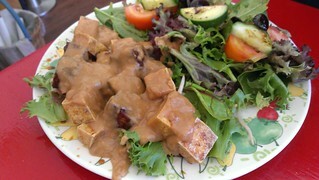 I ate all of the tempeh in the salad, and while the peanut sauce is food the best still belongs to Araya's in Seattle. Las Vegan also has a small shoe shop, Vegan Style, in the back. Afterwards we took a wander down Smith Street, popped into Vegan Wares and also had a look at some of the organic shops and cafes in the area. 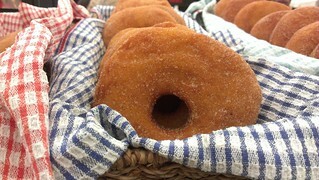 Note for everyone: Friends of the Earth stocks Crumbs goodies, including Sourdough Cinnamon Sugar Doughnuts! It was really hot while we were walking, so we stopped into another organic shop and picked up a refreshing watermelon ice block. 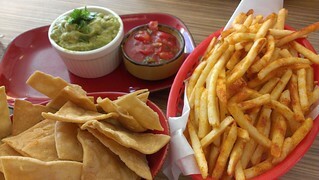 We ended up at Trippy Taco for an afternoon snack of their spiced fries, corn chips, guac and salsa. Unfortunately about half an hour after this both of us began feeling extremely uncomfortable in our tummies, and we went back to the hotel to have a rest out of the heat and hopefully calm our tummies before birthday dinner that night. How did it end up? More next time! This is the photo of Dim Sim I took right before I left. So pretty.